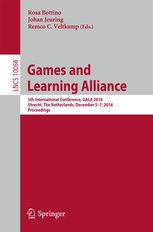 This book constitutes the refereed proceedings of the 5th International Conference on Games and Learning Alliance, GALA 2016, held in Utrecht, The Netherlands, in December 2016. The 27 revised regular papers presented together with 14 poster papers were carefully reviewed and selected from 55 submissions. The papers cover topics such as games and sustainability; games for math and programming; games and health; games and soft skills; games and management; games and learning; game development and assessment; and mobile games.